The largest New Caledonian island by far, Grande Terre is a tropical paradise of gorgeous beaches, fertile mountains, unique plant and animal life, and a vast biodiversity to explore. The central mountain range, La Chaine (The Chain), divides the long, thin island in two, and shelters a complex of geographical niches and microclimates where endemic species thrive. An extensive barrier reef encircles the island, creating one of the largest lagoons in the world. Like the island itself, the lagoon is filled with a great variety of wildlife, much of it unique to the region, including endangered species such as dugongs and green sea turtles, which nest here. The towns and cities that skirt the island show a strong French influence mixed in with the Pacific Islander way of life. Step out on the town to experience the thriving bar and cafe culture, as well as plenty of gourmet restaurants. Grand Terre is in New Caledonia. 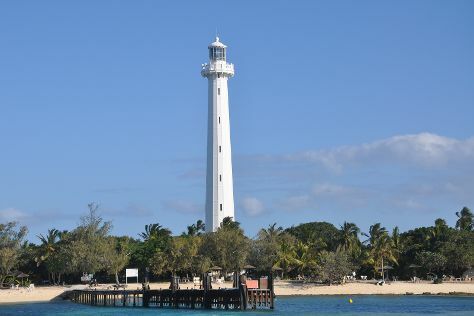 Discover how to plan a New Caledonia trip in just a few steps with Inspirock's itinerary builder.